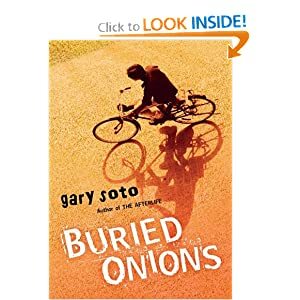 And, today’s YA author in the spotlight is GARY SOTO. Enjoy! AUTHOR: (information comes from the author’s website www.garysoto.com): Gary Soto, born April 12, 1952, was raised in Fresno, California. His poetry collection for adults, New and Selected Poems, was a 1995 finalist for both the Los Angeles Times Book Award and the National Book Award. He has received fellowships from the National Endowment for the Arts and the Guggenheim Foundation. In 1997, because of his advocacy for reading, he was featured as NBC’s Person-of-the-Week. In 1999, he received the Literature Award from the Hispanic Heritage Foundation, the Author-Illustrator Civil Rights Award from the National Education Association, and the PEN Center West Book Award for Petty Crimes. A prolific writer, Soto has authored picture books, middle grade novels, short stories, poetry for younger readers, YA novels, and books for adults and high school students. Other titles include: ACCIDENTAL LOVE, THE AFTERLIFE, TAKING SIDES, and BASEBALL IN APRIL AND OTHER STORIES. FROM THE BOOK JACKET: All of my life everyone was pulling away from me—Father, my mom, Jesús, school friends, and homies who disappeared in three lines of the obituary column. I could have cried under the heat of Fresno, but it wouldn’t have mattered. My tears would have evaporated before anyone saw my sadness. Fresno, California, is such a sorrowful place that nineteen-year-old Eddie imagines there must be onions buried underground, their vapors drawing tears from the residents above. Eddie is trying hard to stay out of trouble and make a decent living, but he’s not finding it easy—especially with his aunt urging him to avenge his cousin’s murder. Will Eddie get caught up in the violence he despises? Or can he escape this land of buried onions? MY TWO CENTS: Soto’s talent as a poet with a keen eye for detail and skill for beautiful description is always evident. The buried onion image runs throughout the novel, as Eddie navigates life in a community plagued by gang violence and few real options for a brighter future. Soto writes: “For me, there wasn’t much to do except eat and sleep, watch out for drive-bys, and pace myself through life. I had dropped out of City College, where I was taking classes in air-conditioning. I quit not long after my cousin, mi primo, Jesús got killed.” Eddie struggles to work honestly and ultimately has to decide whether to stay in Fresno or get out by joining the military. While this is a sad tale on many levels, there is hope in Eddie, who refuses to give in or give up. Find BURIED ONIONS on Amazon.com and Goodreads.